For Peter Cobb '82, the power of the Internet saved his life. In 1997, Cobb was diagnosed with a cancer so rare his doctors weren't sure how to treat it - or if it could be treated. So he did what any desperate computer-age consumer would do: He scoured the Internet for experts. Several replied and recommended an oncologist in Denver, near his home. Cobb was told his type of sarcoma doubles in size every 10 days and leaves victims with a 20 percent three-year survival rate. But his aggressive approach helped him beat the odds. After five rounds of chemotherapy and two surgeries performed by Lance Armstrong's doctor, Cobb says his doctors told him to "figure out what to do with the rest of my life." That was easy. 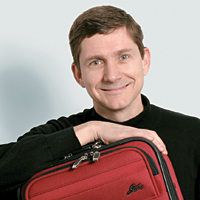 In 1998, he and a few friends started eBags.com, the first Internet business to sell luggage and handbags using drop-shipping. With no inventory, because manufacturers ship items directly to customers, eBags is able to offer more than 15,000 products. The company has expanded into Europe and, in 1999, launched a second site, Shoedini.com, specializing in (you guessed it) footwear. But Cobb's experience with cancer was not over: His wife had a recurrence of breast cancer and died in 2001. He remarried in 2003 and has a family that includes his son, 11, and two stepdaughters, 9 and 12. Cobb credits the Kellogg School for "teaching me to look at other ways to find a solution." He credits being cured for giving him "a second chance at life and the opportunity to create something that has never been done before, something my kids are proud of."